Vladimir Samsonov did a lot of testing when he put together this plywood layer combination with a newly designed blade shape and the new 'contact grip system' to produce a perfectly balanced, slightly swinging attacking blade. This blade gives the feeling of absolute control and speed needed for the succesful attacking game. 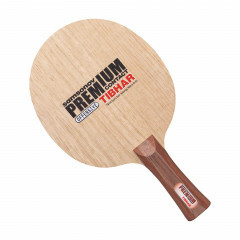 Tibhar Blade Samsonov Premium Contact is beeing added to cart.